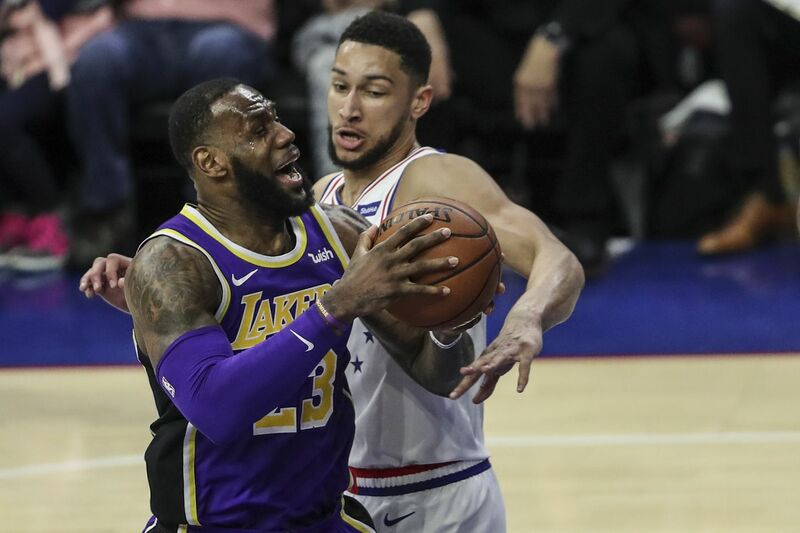 LeBron James tries to drive around the Sixers' Ben Simmons. LeBron James scored 18 points in a loss to the 76ers on Sunday at the Wells Fargo Center. The distributor — LeBron James opened up the game with a bounce pass to one-time Sixer JaVale McGee in the paint for a easy two. The dime was the first of James’ nine assists on the afternoon. Celebrity sightings — The stars come out when The King is in town. Celebrities in attendance included Eagles Carson Wentz and Alshon Jeffery, Millville’s own Mike Trout, Sixers great Allen Iverson, Lakers’ president of basketball operations Magic Johnson, Patriots owner Robert Kraft, the Union’s Marco Fabian, Kendall Jenner, M. Night Shyamalan, Kimmo Timonen, and Lil Uzi Vert. Philly’s favorite foul — When opposing players commit fouls against the Sixers, the home crowd usually joins in with cheers. But maybe no other player illicits the reaction that James does. Midway through the fourth quarter, the Philadelphia crowd rose to its feet and cheered when James committed his third foul of the game — a non-physical and otherwise boring call. Almost there — James shot 50 percent from the floor, but he struggled to find individual scoring opportunities on Sunday. Even with some of those struggles and the Lakers losing, James closed out the night with 18 points, 10 rebounds, and nine assists, just one assist shy of a triple-double. James currently ranks sixth in all-time career triple-doubles with 77. One more triple-double will tie him for fifth with Wilt Chamberlain, who collected 78.